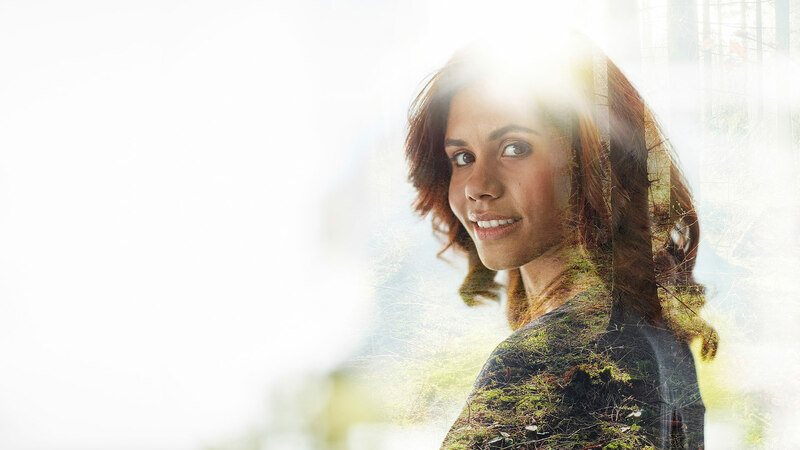 Get a monthly plan and offset your company’s CO2 emissions in the easiest way. Our Serial Planter plans for organizations make CO2 compensation easy. Become a Serial Planter organization and each month Tree-Nation will plant your trees by carefully selecting the species that will offset the amount of CO2 corresponding to your plan. We will plant your trees on a monthly basis, to offset 12 tons of CO2 per year for each employee. We will plant your trees on a monthly basis, to offset the number of tons of CO2 you need. If you need to calculate your CO2 emissions or need to offset large quantities contact us and we will prepare a plan tailored to your company’s needs. This tool allows you to offset a one time amount of CO2. Come back to offset more CO2 anytime you need. Tree-Nation will plant your trees by carefully selecting the species that will offset the precise amount of CO2 you selected. Offset a one time amount of CO2. We will plant your trees to offset the number of tons of CO2 you selected. The “by employee” plan is ideal if you are a labour-intensive company (versus a capital-intensive company. See below). If what your company sells are mainly non-physical services or products and/or if your activity depends mainly of your team skills, your emissions are mainly linked to your team. This plan therefore focus on offsetting your impact as a team (and more). It may be hard and costly to calculate your exact company’s CO2 footprint. So at Tree-Nation we created a “by employee” plan that can integrate your full footprint but has the benefits of being very simple to calculate and can easily expand as your company grows. We consider that a service company footprint is the sum of its’ employees footprint. Anything related to your employees (office needs, travel, electricity, staff furnitures, …) will be included in this calculation, but as this is not a precise calculation and your company can have other sources of emissions, we just offset much more than what is strictly needed. Tree-Nation bases its calculations according to the official European average: 9 tons CO2 equivalent* per capita emissions (Eurostat, 2013). These are the total annual emissions of a person, including his personal footprint but also his time-in-office/work footprint. Every kind of emissions are included in this simple figure. * Carbon dioxide equivalent or “CO2e” is a term for describing different greenhouse gases in a common unit. For any quantity and type of greenhouse gas, CO2e signifies the amount of CO2 which would have the equivalent global warming impact. By offsetting 12 tons for every employee working in your company, you are not only offsetting their emissions at the office but also their personal emissions outside of it. We could have considered only taking a part of those 12 tons, the one that strictly correspond to your company, but we believe it’s a great thing for companies, to offer your employees the gift of being CO2 neutral. This very large extra also takes care of any imprecision on this method: you can be sure you are offsetting at least as much as you need, and certainly more than this. A company may not want to limit itself to just being neutral, which means having neither a negative nor a positive impact on the climate. That’s why we take care to make your impact not only neutral but decidedly positive. For this we add 3 extra tons per capita per year, totalling then 12 tons. On a monthly basis, Tree-Nation will plant your trees by carefully selecting the species that will offset the amount of CO2 corresponding to your chosen program. At the beginning of each month, you will be informed about the new trees we planted for you. You will also discover the ‘surprise species’ of the current month. 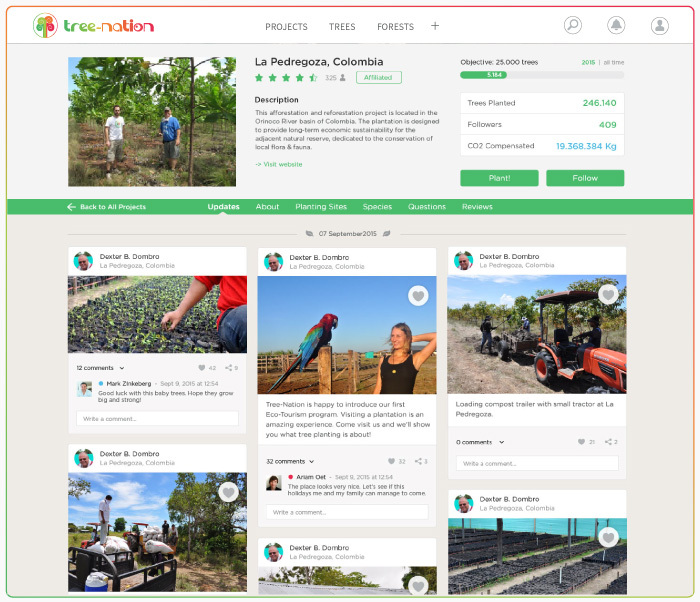 The species are selected by Tree-Nation with the objective to make you discover new trees and planting projects. All the trees will be part of your company forest. You also have the option that each employee receive his corresponding trees by email. In this case the trees will both appear in your company’s forest profile and your employees own profiles. The “by ton” plan is ideal if you are a capital-intensive company (versus a labour-intensive company. See above). If what your company sells are mainly physical services or products or if your company specializes in manufacturing, delivery or similar, for physical end-products, goods or raw-material, then your emissions are mainly linked to your activity. This plan therefore use your calculated figures and adapt tree planting accordingly. Just indicate the number of tons you would like to compensate per month. You may have this figure per year, so just divide it by 12 to insert your per-month value. In case you do not yet know your CO2 emissions ton value, please contact us so we help you with the calculation process. Regardless of the Serial Planter plan that you select, all your trees will always appear in your company’s forest. 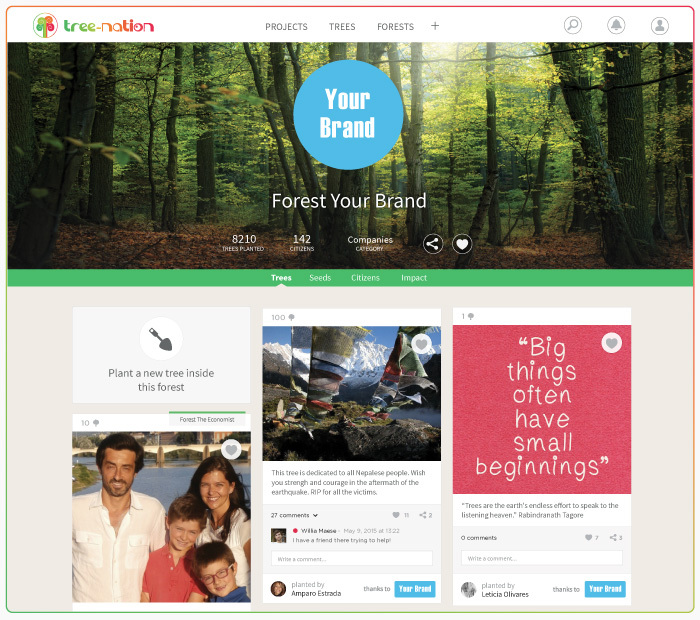 This page can be personalized with your brand logo, website, and description. 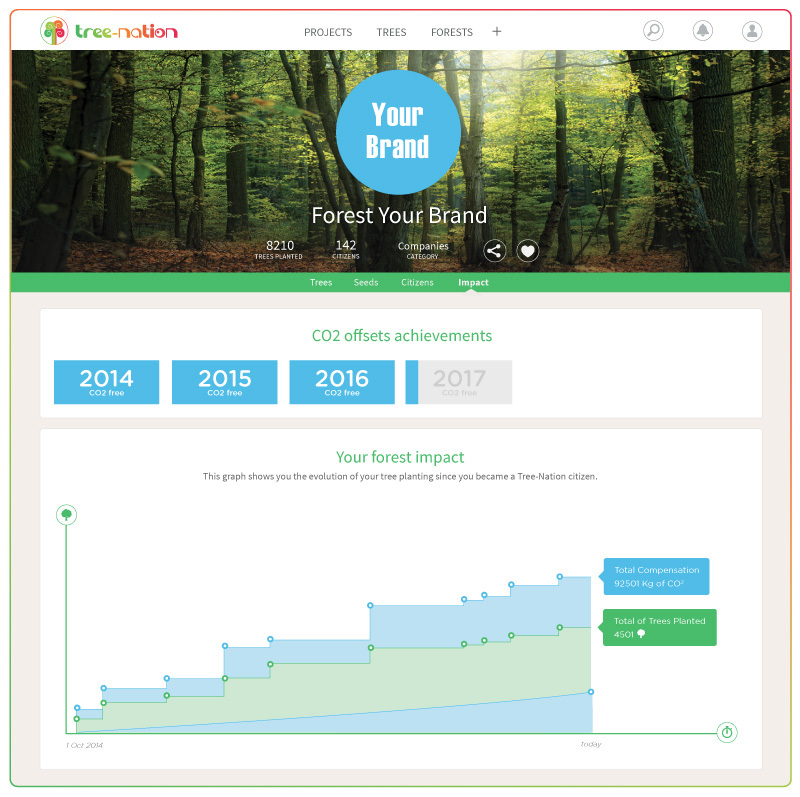 All the CO2 compensated is accounted for and displayed inside your Company Forest, under a section named “Impact”. This way you can keep track of your company’s CO2 emissions offsets and communicate it with confidence with your clients. Get frequent updates directly from the field. Our planters communicate regularly about their planting activities. These updates follow two formats: articles (like a blog entry) and posts (like a Facebook post). You can also share them freely on your website and through social media outlets (Twitter, Facebook, Instagram, etc. ).